Hilton Head Island is known for its pristine beaches, lush golf courses and plentiful tennis courts. But ask a dedicated tourist where to go to sample the island’s best offerings, and Shelter Cove Harbour and Marina often tops the list. With renowned Lowcountry artist Wayne Edward’s towering sculpture of King Neptune at its center, Shelter Cove is a one-stop spot for all-things Hilton Head, from restaurants, shopping and live entertainment to fishing excursions and guided kayak trips. Now, the vendors at Shelter Cove are trying to get the word out that the scenic harbor, located across from Palmetto Dunes on William Hilton Parkway, is not only the perfect destination for summer guests, but also the ideal place for visitors and locals alike to enjoy the island lifestyle all year long. As the largest deep water marina on the island, Shelter Cove provides a multitude of ways to get out on the water. Anglers can join charter boat trips for inshore and offshore fishing. The Captain Hook party boat offers a way to celebrate special occasions or family gatherings on the water. Those wanting to get up-close and personal with Broad Creek and the Intracoastal Waterway can sign up for guided kayak tours, where paddlers can explore the water and catch a glimpse of coastal birds and playful dolphins. If shopping and dining are on your “to do” list, Shelter Cove is a treasure trove. From Christmas on the Harbour to Life’s a Beach, Camp Hilton Head, Currents and Taffeta, shoppers will find everything to deck their homes or enhance their wardrobes. If it’s jewelry or accessories on your list, visit Neptune’s Niche, Queen Bee at the Back Door, and S.M. Bradford Co. The visual arts are showcased at Shelter Cove at three galleries that feature world-class artists: Nash Gallery, La Belle Image and Bolton Smith Harbour Art Gallery. If you’re hungry, there’s something for every taste bud, from San Miguel’s Mexican Café to Ocean Grille, Little Venice and Parrot Cove Café. Seafood is featured at Kingfisher Seafood and Scott’s Fish market. The Gourmet Gallery’s claim to fame is its fudge. There’s even a place for those who desire personal enhancement. Anjuli’s Harbourside Hair offers a wide range of services, from coiffure to nail care. If you fall in love with Shelter Cove, a wide range of villas—many with waterfront views—are for sale and rent. Aside from the everyday offerings at Shelter Cove, the resort is also the site of one of the island’s most popular festivals. The summer-long HarbourFest, now in its 19th year, starts June 5. Family fun is offered from 6:30 to 9:30 p.m., including food, entertainment and arts and crafts. Troubadour, Shannon Tanner, has been a part of HarbourFest since 1991. A beloved performer who invites children in the audience to take part in his shows, mixes ’60s tunes, sing-a-longs and original ballads for a performance that appeals to the whole family. Tanner performs one show nightly at 6:30 p.m., Monday through Friday in April and May, and two shows at 6:30 and 8 p.m. June 4 through Sept. 2. One of the most popular highlights of HarbourFest is the Tuesday night fireworks, provided by a number of local sponsors, including the Shelter Cove Merchants Association. The fireworks show starts at sunset, June 5 through Aug. 21. A special Fourth of July fireworks show is also a Shelter Cove tradition. Outside Hilton Head gives people a way to watch the fireworks from the water. Its “Fireworks Paddle” guided kayak tours are offered June 5 through Aug. 15. Shelter Cove Harbormaster, Dave Harris, has a unique perspective on the rich history of the marina, which has become an island icon. Harris has been harbormaster since the marina opened in 1983. Back then, his office was located in a trailer, and for many years, the marina was the only stop along William Hilton Parkway between Coligny and Pineland Station. Today, folks will find everything they need for a good time at this one-of-a-kind locale. “It [the marina] is what makes Shelter Cove different from any other resort around here,” Harris said. 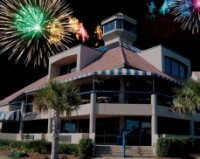 For more information on Shelter Cover Harbour and Marina, call (843) 785-1106 or visit www.sheltercovehiltonhead.com.